Details of UK troops killed in Iraq and Afghanistan are being recorded in tables compiled by the BBC News website. This guide explains how the information is put together. 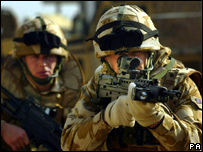 Details of British casualties in Iraq and Afghanistan are released by the Ministry of Defence. The MoD has a public record of these fatalities, which is routinely updated following a death. In some cases information may also come from other sources, such as contemporaneous BBC News stories, official reports, relatives' statements and inquests. Why are some of the details incomplete? If some of the information relating to a casualty has not been confirmed, the relevant space is left blank. Following a fatality the MoD often confirms only that somebody has died and, perhaps, some basic information such as the regiment and the place of the incident. Further details such as the name and home town of the person killed and a picture are often released at a later date. The tables are updated as soon as possible after information becomes available. Are all the casualties British? No. The tables include details of overseas nationals who were killed in Iraq and Afghanistan while serving with the UK Armed Forces. Among the fatalities are nationals of Australia, Fiji, South Africa and Zimbabwe. Why do some of the numbers in the figures page appear different from MOD figures? The MoD classification of "killed in action" covers a number of different types of incident including friendly fire and some accidental deaths. In order to show a greater level of detail, we have split the data a different way and grouped together deaths caused by hostile action, friendly fire and accidents, whether or not these happened "in action". Therefore the number of fatalities caused by hostile action on our table will be smaller than the MoD's "killed in action" category. Are insurgent or Taliban figures reported? BBC Defence Correspondent Caroline Wyatt explains : "In our coverage of Afghanistan, we at BBC News do not generally report the numbers of Taliban or insurgent casualties and fatalities, because there are no reliable or verifiable source figures available."